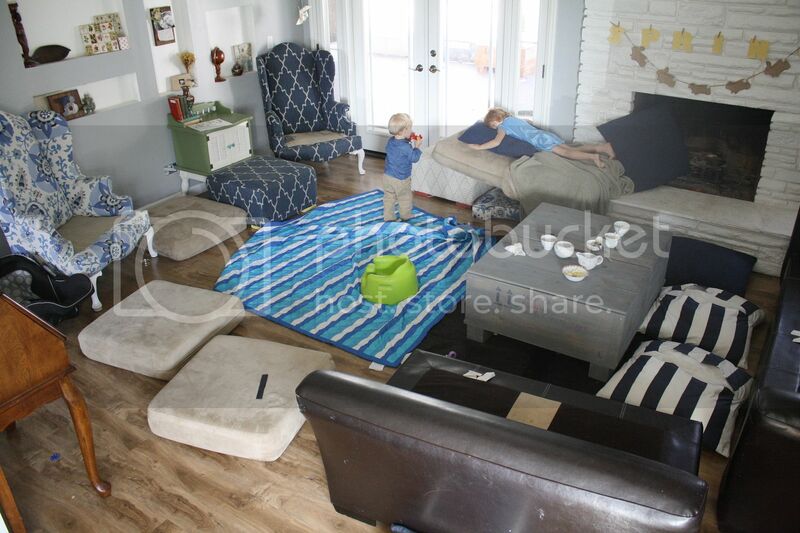 As I sit, stealing a few moments peace in the mist of the chaos swirling around me to write this post, my kids run on a homemade track of pillows, circle after unending circle around the living room, and I actually smile at the mess they made. This progression of attitude has been four years in the making. My visions of a professionally designed home with white walls and light grey couches quickly diminished after my first and were completely obliterated after my second. I have sacrificed perfection for sanity, and I am finally okay with it. My name is Andrea, and I am redefining perfection. I have memories as a little girl falling asleep at night to a running internal dialogue, reciting the exact location of all the things I love, and some that I just unnecessarily obsessed over. After having my first child, this dialogue turned away from the things I loved and focused sharply on the things that were bound to drive me crazy. I knew it too, I knew that this obsessive compulsive desire to know where all five of our pacifiers were at any given time, two in the bag, one in the side pocket, one in the front, one under the bed, one on the window sill and...crap, we lost one, how could we loose one, I am going to fail as a mom, I can't even keep track of 5 pacifiers, was going to literally drive me insane. Well, on October 29th 2010, I called it quits on the unattainable perfection of keeping track of everything that comes along with a new baby, and decided to only sweat the big stuff. I would from then on dedicate my time to the things that evoke emotion, the dresses that I can give to Scarlett for her future children, the pictures reflecting memories that will fade with time, the jewelry that might loose its sparkle but always keep its story. I will surrender to just enough obsessive behavior to remember what is important and let the rest of my craziness slowly chip away one pacifier at a time. Then came baby number two, he turned one and she turned four, the house became messier, the crafts became bigger and more frequent and I reverted into my insane behavior, demanding perfection in my children and myself. As a part time stay at home mom, my two special days with my children turned into personal fits of frustration and self doubt. I would half finish cleaning dishes left out from breakfast, get distracted by the buzzing dryer, and on the way to laundry, would start picking up books and legos that somehow made it to the living room floor. I was never fully in one place, pieces of me scattered around the house, and not one piece of me was attending the needs of my children. In an effort to keep the perfect house, I was loosing every opportunity to be the perfect mom. Or at the very least a mom at all. Essentially, I was using way too many "in a minute"'s and "hold on"'s and "after I finish"'s. And not enough, "Can I be the princess this time" and "what game should we play" and "let's do this together this time"'s. So two weeks ago, I decided to stop. I stopped obsessivly picking up crayons, I let the dishes rise and the couch cushions sit in a circle all day long, the laundry was done, but sat in pile on our bedroom floor, waiting for my kids to go to bed. I stopped worrying about being the 50's housewife and worried about just being. In between a game of Life, getting a check up from two pretty adorable doctors and make believe restaurant, we cleaned up, made housework a game, and cooked dinner. Although everything took way longer than it would if I was doing it alone, I wasn't alone, we were together and we were happy and my kids learned how to help and I learned how to be the perfect mom. Not perfect in that everything was done and we were all smiles and roses all day long, but perfect in that I just was. I was perfect for them, in that time, on that day. So now, when I look around my disaster of a house, instead of seeing unconquerable chaos, I see an hour of work after the kids go to bed and the smile on their faces. My name is Andrea, and I am still redefining perfection, one day at a time.